If your Universal FMS System is not on a general maintenance program, you run the risk of losing valuable Pilot Data. The Universal Avionics Flight Management System (FMS) has two batteries. 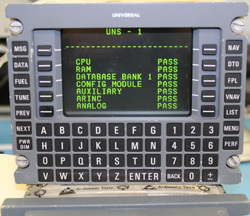 One is located on the CPU board that supports Flight Plans and Navigation databases. The other is located on the GPS board and supports the GPS Almanac information. It isn’t unusual for these batteries to begin to lose power or fail with minimal warning resulting in a CDU Data Bus Failure message being displayed. As previously stated, this failure can happen quite suddenly. The crew may get a “Low Battery” message at start-up on the first leg of a flight, but then have a “CDU Data Bus Failure” message on the start-up of the return flight. When this happens, the FMS becomes unusable until the battery is replaced. Depending on your current flight schedule and where you are located, the downtime could be hours or even days. Especially if it becomes necessary to order a rental unit from the OEM while your unit is sent in for battery replacement. When there is sudden battery failure, you also lose valuable Pilot Data. After this failure is noted, the only way to replace the data is for pilots to manually re-enter the data after the batteries are replaced. Below are two simple solutions to avoiding the sudden loss of battery power and potentially all of your stored pilot data. It is perfectly fine to retain the original Universal Avionics FMS batteries. However, we recommend that you tie the battery replacement to an airframe maintenance event already on a two-year general maintenance program. The original Universal Avionics FMS batteries are still currently available, however could at some point in the future be discontinued. At that time, operators will need to switch to the new Extended-Life battery modification. Universal Avionics has issued a battery modification that considerably extends the useful life of the batteries. More importantly, this new battery appears to have a steadier decline in voltage, prolonging the low battery indication which in turn, could allow the pilot up to three months to schedule maintenance. However, to ensure continuous battery operation, we recommend you put the FMS with the new battery modification, on a four-year general maintenance program for battery replacement, reducing the likelihood of the sudden loss of battery power and pilot data. If you do this on a dual FMS System, you will save hundreds of dollars of maintenance over the life of the battery. Waiting too long to replace your FMS batteries also increases the probability of CPU board damage due to battery corrosion. Although a battery may have exceeded its life expectancy, the longer battery replacement is put off, the greater the chances the battery will begin to leak and cause corrosion and damage to the CPU board. When this happens, the CPU board must be replaced at a potential cost of more than $3000. Both the two-year maintenance cycle of the current FMS battery and the new Extended-Life battery modification can be performed at Duncan Aviation. And by using Duncan Aviation's AOG service, turn time can be as little as one day, if scheduled. To discuss your Universal Avionics FMS Battery maintenance options, call Duncan Aviation’s Avionics Tech Reps.
To schedule your next Universal Avionics FMS battery maintenance event, contact Duncan Aviation’s Avionics Customer Account Reps.
Scott McKenzie is an avionics tech rep located in Duncan Aviation's Lincoln, Nebraska, facility. He specializes in troubleshooting the latest in avionics systems installed on aircraft today. His aviation career began in 1995. Rod Walther is an avionics team leader located at Duncan Aviation's Lincoln, Nebraska, facility. He leads a team that specializes in NAV systems. His aviation career began in 1993.